The IBM WiFiState.exe Utility and the XCenter Wireless Widget. The WiFiStat.exe monitoring utility really is a great utility provided by IBM. It works with all the WLAN WiFi drivers except the CISCO 340 driver, and it allows you to change NIC setting on the fly (you do need version 1.5 or higher of Artem's driver). Remember, all settings can be changed using the NIF file via MPTS, but then you are obliged to reboot. WiFiStat removes this obligation (at least, when changing the most used settings. For settings like channel and others, you'll still need to use MPTS, and you'll need to reboot in those cases.). In fact, the only thing you need to do in MPTS is add the driver and attach a protocol to it. Also, very nice feature, you can specify up to four different Profiles, so that you can select the appropriate profile in a particular situation. A profile is a selection of important settings that determine a specific wireless network connection. The main window is very easy and straightforward; its title bar states its name and also the currently activated profile. The are two fields that always appear; the Status: field, which will tell you whether you are still searching a WLAN or whether you're already connected to one. And then, there's the SSID: field. SSID is the abbreviation of Service Set Identifier. It's a name for the wireless network and it's sometimes simply called Network Name. In infrastructure mode, the SSID should be set to the same value as the WAP; in ad hoc mode, the SSID on ALL notebook (or for PC using PLX board) network cards in the network must be set to the same value. In the example above, my ad hoc network was called Wireless. As you can see, you can hide this field by right-clicking anywhere in the main window, and selecting Hide SSID. Analogous, you can re-enable SSID by selecting Show SSID. Should you often make use of Hot Spots then you'll undoubtedly have the need to connect to any wireless network without explicitly specifying the SSID. Therefore, simply leave the SSID field blank, and this will have the same result as specifying "ANY" using Windows wireless device drivers. Very handy is the green indicator showing you the quality of your connection. The rectangle will be 100% filled when your connection is the full 11Mbps, the maximum. If the speeds are lower, then you will see this in this rectangle. If you haven't got connection yet, but are searching for the presence of a WLAN (and notice a WLAN announces his presence, which causes security issues! ), the Status: field will state Connected to IBSS, and sometimes it is changed by Searching for WLAN. the latter message will be displayed if you disabled the Create a Network if none found option. The former will be displayed once this option is enabled. Note that IBSS will only be displayed in ad hoc modes, when there is a Wireless Access Point present, then BSS or ESS will be displayed. BSS is there's only one WAP, ESS is roaming is configured and/or if there are multiple WAPs. The rectangle at the right is not green, you can hardly see a small white vertical line. The options Radio On and Radio Off in the main windows' pop-up menu respectively will enable and disable your WiFi card's working. This is a handy feature, since you needn't even remove the card when entering an airplane or a hospital (where the WLAN waves could interfere with the infrastructure). As already pointed to above, you can specify several profiles. This means you can specify for example two profiles, one for a connection in a WLAN with a WAP, and another for an ad hoc connection. Instead of having to change this using MPTS an then rebooting, in order to activate that kind of WLAN connection, just right-click the main window, select Select Profile from the pop-up, and in the submenu, choose the profile you wish. I have called my profile Profile1, but of course, you can assign it any name you want (for the scenario just described, you could name the ad hoc connection AdHoc and the infrastructure mode connection InfrWAP, and that name will appear in the Select Profile's submenu. By selecting a profile, this profile will immediately become active, but first your current connection (if it exists) will be broken. Then, using the new setting, OS/2 will try to establish a new WLAN connection. Also interesting is that this utility (though copyright from IBM) also works with the Artem WLAN cards. The WiFiStat utility is only provided with miniPCI and High Rate 128 solutions, and other IBM WiFi driver solutions. As already said, you can specify up to four profiles for a WLAN device. In this section we'll discuss how you can specify them. To specify a new profile(, or to change: then simple change the values already listed), proceed as follows: right-click the main windows, select Add/Edit Profile from the pop-up menu, which will cause this window at the left to appear. If you change your mind, you can leave this window at any time by clicking the Cancel button. Select the profile you want to edit or a new one from scratch by selecting a radio button. By selecting a radio button next to an empty field, you will create a new profile. Before clicking the Profile Settings button, click in the empty field, and type the name of the profile. This name will later appear the the pop-up menu of the main window. After you have specified or changed the name, click the Profile Settings button. A new window will now appear, with name Settings for 'PROFILEX', with PROFILEX the name you just assigned to the profile. You will note immediately that not all the setting available via MPTS are available, but only the most frequent settings are there. 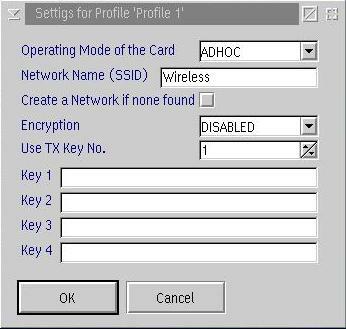 In the drop-down box at the right of Operating Mode of the Card you can specify whether you are going to connect to an ad hoc WLAN network or BBS (Base Service Set, thus a WLAN using infrastructure mode) WLAN. Below, you are going to specify the network name that shall be used by the devices to identify the network in which the nodes belong. Just click in the field at the right and type the name you wish. Note the remarks about SSID in section 5.2.1! Below, there's a check-box Create a Network if none found. I have experienced it's best only to enable this with one NIC in an ad hoc network, and not to select it when using a WAP. Next, there's a drop-down box for Encryption. For "secure" data transmissions most WLAN NICs are capable of encryption, scrambling the information that is sent over the air between computers. The WAP uses a form of encryption called WEP (Wired Equivalent Privacy). There are two levels (the latest WiFi cards make three of that by adding 256bit) of WEP encryption, 64-bit and 128-bit. As the numbers imply, 128-bit encryption is more secure than 64-bit encryption. However, using 128-bit encryption uses keys to scramble and unscramble the data that is being sent between the wireless equipped computers. The wireless network must use the same key to be able to communicate using encryption. Note that WEP is an effective security alternative, but if your card supports it, you should use it. To enable security, select one of the options (WEP64, WEP128) from the drop-down box. Be sure your card does support encryption! In the last four text boxes, you can specify the WEP keys that will serve as a kind of password for data to pass from one node to another, since both the nodes (and in general ALL nodes in the same network) need to have the same WEP keys. You can enter 32 characters per text box. Though you can specify four encryption keys, only one can be active at a time. To make OS/2 use a particular key, specify the number of the key in the TX Key No field. If you do this, be sure that key is specified! 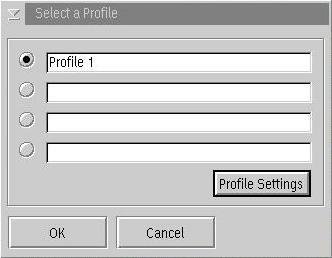 To finish the creation of your profile, in the Settings for Profile 'PROFILEX', click the OK button. To dismiss the changes, press the Cancel button. Then you'll return to the Select a Profile dialog box. Click OK. Now you can immediately start using your profile by right-clicking in the main window, selecting Select Profile from the pup-op, and then choosing the profile you just created. Also note that if you select the same profile from the WiFiState pop-up menu, the current connection will be broken and a complete new one will be set up. In what follows, we try to illustrate how you can take full advantage of actually establishing a wireless network and how WiFiState offer the right tools for understanding what's going on. Note that the old PLX9052 driver does not always detect changes (remove or insert of PCMCIA card) automatically. The PLX functionality included in the Generic PRISM RC driver should remove this limitation. We should first note something very important. When using an ad hoc wireless connection, make sure that the option Create a Network if none found is active on AT MOST one node of the wireless network. This setting will cause the appropriate WLAN card (on which this setting has been enabled) to automatically create a wireless network, and announce its presence. The other nodes connect on this WLAN. However, if two or more nodes of the same wireless network have this option checked, and (as it should normally be) the SSIDs of all these nodes are the same, then different WLANs with the same SSID will be created but on different channels, thus making sure that the devices won't be able to connect with each other correctly. In the image below, we have in fact no wireless network connection yet. However, this profile had the Create a Network if none found option checked (enabled) and thus this particular WLAN card in the network sets up a complete new network, according to the specs in WiFiState current profile and MPTS settings. Therefore, the node is indeed connected to the WLAN (see "Status: Connected to IBSS" in the WiFiState window). Another note comes in here: The 2 Mbit/s field is rather erroneous. In fact, if WiFiState states a speed of 2 Mbit/s, you can be sure that you have NO wireless connection. 0 Mbit/s and 2 Mbit/s are thus the same. Now, once we have a correct configuration on all nodes in the network, and once a WLAN is created either in ad hoc by the Create a Network if none found option, or by the Wireless Access Point in BSS, the wireless connection is automatically established. This goes on step by step, and you can see it as a procedural step. It starts like in the image right above: a very small white stripe, indicating that there is no connection yet. Then, like in the images below, we have a small red stripe (sensitive and weak connection), a yellow rectangle (sensitive connection, but wireless networking is possible without problems), and a large green rectangle (very good to best connection). The rectangle is being formed from left to right, and as the connection is established, the rectangle is torn out to the right. Once you have a full green rectangle like the fourth image below, you're WLAN is up and running perfectly. Sometimes, it may appear that WiFiState keeps displaying the Phase 3 screenshot, even though everything is actually configured correctly. In that case, try pinging the/an other node in the WLAN and then most likely, Phase 4 should be reached. The images illustrate the optimal conditions, and can only be expected when you set up a WLAN initially with two devices in the same room, which I advice you to do. Once you have your WLAN configured correctly, you can move the node(s) to their proper positions. As already pointed to in the previous articles, the speed of a wireless LAN does not slow down like on wired LANs in that the speeds increases or diminished with some bytes per second. In IEEE 802.11b WLANs, you have only these possible speeds: 11Mbps, 5.5Mbps, 2Mbps or 1Mbps. As you would expect, WiFiState offers you the possibility to have a look at speeds. Speeds do rely on the quality of the WLAN connection. Since the quality of a connection can be seen in the colored rectangle in the upper right corner of the WiFiState window, as the rectangle gets larger, the higher will be the WLAN speed. WiFiState also tells us the speed, but keep into mind that both two tools to represent these things are updated a little while later. As you see in the lower right image in the table above, even though you can have a speed of 11Mbps, your WLAN connection can be of a less good quality. The larger the colored rectangle, the better the connection is. Be sure to keep these two things will separated into your mind! Many eComStation users have replaced the IBM WarpCenter by the eCenter, a slightly modified xCenter, part of XWorkPlace. The xCenter of XWorkPlace is a complete replacement of the old (sometimes buggy) WarpCenter. The image below shows a possible xCenter. Click the image to magnify it. The extra functionality is achieved by embedding widgets at the places where you want it in the xCenter. This also implies more customizability than was previously the case with the WarpCenter (also called eComCenter*). The remaining part of this paragraph will deal about the Wireless Widget (wxWireless widget). For more information about the xCenter, its configuration and available widgets, we refer to one of the links in the Related Links area of the left navigation bar. To install the wxWireless widget, download the wxWireless ZIP file from the os2warp.be Wireless Device Drivers downloads page, and unzip it in the \plugins\xcenter directory, located in the installation directory of XWorkPlace (for the eCenter included with eComStation 1.1, this folder is c:\ecs\system\ecenter\plugins\ecenter). Then, just right-click any free space of the xCenter, click Create new widget	, and then select XWireless LAN Monitor. The Wireless Widget is added, and you're ready to configure it and use as a tool to facilitate your daily wireless networking. The widget displays the strength of the signal, in a similar way as WiFiState, described in section Line Speeds. By pointing to the widget, you can see from the picture above, that the other information available from WiFiState is displayed. *: Please note that eComCenter is not the same as eCenter. eComCenter equals the WarpCenter, eCenter equals xCenter. In contrast to the WiFiState utility, the Wireless Widget takes not a lot of space on the screen, and certainly no seperate window is required. Everything is taken care of via the small widget in the xCenter. Again, up to four profiles can be specified. However, there's one extra thing. The options "Include in profile scan". You should enable this option by clicking in the square box in front of it. This is the extra power of the wxWidget: Profile Scanning. Upon inserting of a wireless network card, the driver will report the Wireless LAN Widget that a wireless connection could be made. Immediately after, the wxWireless widget will check all profiles, from the first one to the fourth, and if it encounters one that is suitable, it will automatically try to establish a connection to a wireless network in that configuration. DHCP lease should be manually requested, though. Only the profiles in which the Include in profile scan was enabled will be checked in the profile scan. The option Scan Profiles allows the user to manually do the profile scan as described above. Also, in the popup menu, the Enable Radio and Disable Radio options are familiar. They have the same functionality as the same commands in the WiFiState utility. The Delete Widget command removes the wxWireless widget from the xCenter, and the XCenter Proporties option will open a dialog box to edit the Proporties of the xCenter. Close XCenter will close the xCenter. Last modified: 2004/08/30, 18:00 | This site is sponsored by Mensys B.V.